Home / CSR / Events/ The Mace: Not to be touched! The Mace: Not to be touched! The recent action by a senior MP and former minister in removing the Mace during a heated Parliamentary session drew public attention since grabbing the mace is considered a ‘grave crime’ in parliamentary tradition. There have not been many such instances in the Sri Lankan Parliament and each time it happens it becomes the talking point as a breach of parliamentary privilege. Why is it considered such a dishonourable act? Possibly because ‘Honourable Members of Parliament’ are expected to maintain dignity and decorum of the House and forcibly removing the mace is ‘not the done thing’, as we say in common parlance. 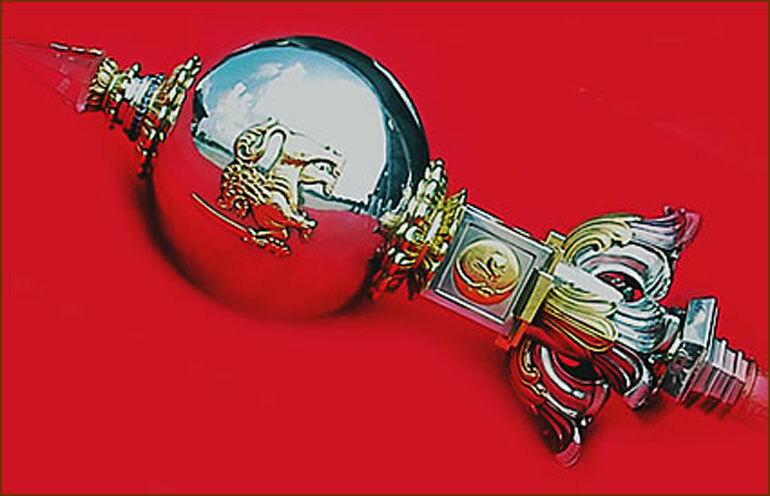 The Mace is the symbol of authority of Parliament. For the business of the House to start the mace is ceremoniously brought in by the Sergeant-at-Arms, the custodian of the mace, carrying it on his right shoulder. He heads the Speaker’s procession. The Secretary-General of Parliament and the Deputy follow him with the Speaker in his official garb coming next. The Members stand and keep standing until the mace is placed on the desk below the Speaker’s chair and the Speaker himself bows and takes his seat. When the mace is removed by the Sergeant-at-Arms it symbolises that the sessions are over for the day. The use of the mace started with the adoption of the Westminster model of parliamentary system of government recommended by the Soulbury Commission. Though the first Parliament met in September 1947, it was one year after Independence that the mace was introduced. It was a gift by the British House of Commons to the House of Representatives in 1949. The beautifully-carved mace weighs 28 pounds and measures 48 inches in length. The staff is made of ebony and decorated with silver, 18-carat gold and sapphires. The design has been inspired by traditional Sri Lankan art. Although the mace has been in use after 1949, records refer to initial discussions to have a mace and to appoint a Sergeant-at-Arms being held in July 1931 during the first State Council set up following the recommendations of the Donoughmore Commission. A Committee comprising Speaker Sir Francis Molamure, Susantha de Fonseka, Major J.W. Oldfield, Dr. V.R. Shockman, D.D. Athulathmudali and G.N. Farquahr, Secretary to the State Council had discussed the issues. In March 1933, the State Council had considered the powers and functions of the Sergeant-at-Arms, his staff and other matters including the procedure that should be followed when admitting visitors to the galleries. However, it was not until the first Parliament was elected that these took effect. The first Sergeant-at-Arms, M. Ismail MBE was appointed in 1947 He held the post until 1961. He was succeeded by Ananda de Silva who was Assistant Sergeant-at-Arms. I remember big, burly Ismail walking into the Chamber carrying the mace in the old Parliament (now the Presidential Secretariat) passing the press box which was in a corner alongside Opposition MPs. That was the era when we, as Parliamentary reporters, had to wear a tie and coat (there were no reporters wearing national dress) to report proceedings from the press box. Opposite us on the Government side was the Officials’ Box. They were often consulted by ministers in the front row whenever a bill relating to a particular ministry was being discussed. 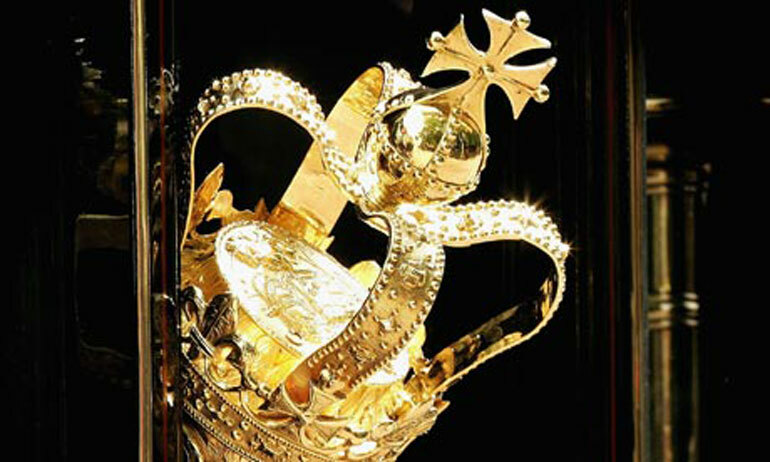 Following the British Parliament’s tradition, most Commonwealth countries use the mace as symbol of their parliaments. The identical procedure is followed in the use of the mace in all the countries. As for the use of the mace, historians trace it to medieval times when the Royal Sergeants-at-Arms were distinguished by their power of arrest without a warrant. Their maces were originally ordinary weapons of war, similar to a club. Later they became their emblems of authority. They were stamped with the Royal Arms; and in an age in which few men could read or write, the Sergeants arrest people by showing their maces and not by producing any form of written warrant. In 1930, John Beckett, a member of the Labour Party, was suspended from the House of Commons for showing disrespect to the Mace by trying to leave the chamber with it while protesting against the suspension of another member. It was wrestled away from him at the door. In 1976, Michael Heseltine, a member of the Conservative Party, seized the mace and brandished it at the opposing Labour Party members, during a heated debate on the Aircraft and Shipbuilding Industries Bill. In 1987, Ron Brown, then Labour MP for Leith, picked up the mace during a debate on the poll tax, and threw it to the floor. The mace was damaged and Brown was ordered to pay £ 1,500 to repair it. When he latter failed to read out a pre-agreed apology to the Speaker, he was suspended from the Commons and the Labour Party. In 2009, John McDonnell, the Labour MP for Hayes and Harlington, in which London Heathrow Airport is situated, was suspended from the Commons after disrupting a debate on expansion of the airport. Following Transport Secretary Geoff Hoon›s announcement that the government had decided to approve a new Heathrow runway without a vote in the Commons, McDonnell picked up the Commons mace. TV pictures of the Commons chamber were cut during McDonnell›s protest. McDonnell was named by Deputy Speaker Sir Alan Haselhurst and, as such, was suspended from the Commons for five days.